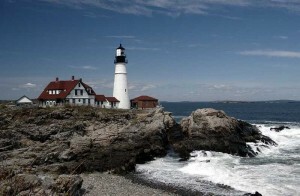 Portland Head Lighthouse is located in Fort Williams Park, in Cape Elizabeth, Maine, less than half an hour drive from Brewster House Bed & Breakfast. It is easy to visit, in a local park, with free access and plenty of parking. The drive through Cape Elizabeth is enchanting, with a mix of old and newer homes, and glimpses of Casco Bay through the trees. The setting for Maine’s Portland Head Lighthouse is dramatic, with its rocky coast and waves which sometimes lash the shore. The small coves to either side of the lighthouse make it a photographer’s dream come true – a site that is the epitome of Maine. The location was the site of different forts, throughout US history and its wars, and now is a community park, with beach, trails, remains of the military installations and a stone house. The lighthouse itself is one of only four colonial era lighthouses whose tower has never been rebuilt. Commissioned in 1787 by George Washington, the lighthouse was first lit in January, 1791. The tower height has been changed more than once, but now stands 80 feet high, and 101 feet above water. On Christmas Eve in 1886 the British bark Annie C. MacGuire was shipwrecked in a terrible storm – so bad, lighthouse keeper Joseph Strout is reported to have said, that even Santa Claus was afraid to be out. The keeper’s family was able to help with a rescue and all aboard made it safely ashore. Much of the history of Portland Head Lighthouse is on display in the small museum in the keeper’s house, which may be accessed for a nominal charge. The rest of the park is free, and is a popular location for picnics, kite-flying, wading, and hiking, all while watching the boats – sail and power – just offshore. I thought this may be of interest to some folks. 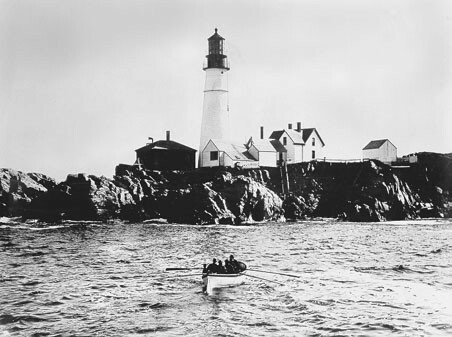 My grandmother(Anna Cameron)was born at Cape Elizabeth, Maine in 1906. Her mother was Elizabeth MacDuffy (my Great Grandmother)the daughter of Capt William MacDuffy and Mary MacDuffy. My grandmother Anna often spoke of spending time at the lighthouse and then moving to New Brunswick by horse drawn wagon when she was about 5 years old. As far as I know Elizabeth a/o her husband William Cameron never returned to Cape Elizabeth. However my grandmother Anna did around 1970 to retrieve a copy of her birth certificate so as to apply for Canada old age pension. If anyone has further interest please feel free to contact me.